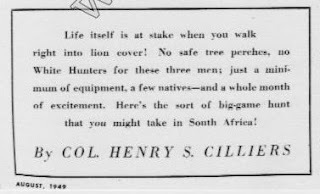 Lion hunting as it was in the days of these articles will never happen again. In fact, many groups want to ban all lion hunting in all African countries! In part this is due to the bad press of canned lion hunting that is so common in South Africa. Not all SA lion hunts are "canned" and large tracts of private land can afford the big cats a chance to escape or to live on their own and kill their own food. On the far other end of the spectrum are the small ranches that feed the lions fresh meat, can actually pat their "pets," and are separated in pastures by mane color. No lie--I've seen it! Anyway, the 15 articles I have scanned will give a good overview of true lion hunting. Some are by hunters who penned a story of their hunt while others are by the best-known hunters and writers of the time. O'Connor's "Lion on the Kilombero" strikes a personal note as that is where I shot my lion in Tanzania's Kilombero River in the Selous in 2006. Brandon Macomber's "Mauled" is a good story whose title tells it all. Macomber was a well-known hunter and a friend of James Mellon. Ralph Hammer's "Too Many Lions" and "Lions on Occasion" by John Burger are two excellent stories by international hunters of some fame. John Kingsley-Heath was a PH and wrote is story of a mauling in "A Lion Mangled Me." The other articles are just as good. I hope you enjoy them and learn of a sport that is nearly no more.